Quercus coccinea is a medium-large deciduous tree growing to 67-100 feet tall with an open, rounded crown. The leaves are glossy green, 2.8-6.8 inches long and 3.2-5.2 inches broad, lobed, with seven lobes, and deep sinuses between the lobes. Each lobe has 3-7 bristle-tipped teeth. The leaf is hairless (unlike the related pin oak, which has tufts of pale orange-brown down where the lobe veins join the central vein). 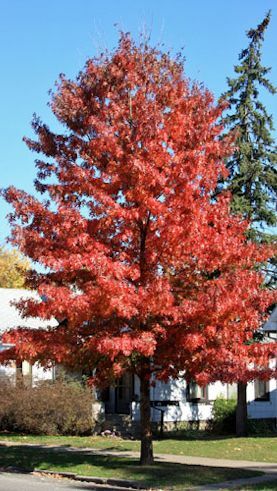 The common English name is derived from the autumn coloration of the foliage, which generally becomes bright scarlet; in contrast, pin oak foliage generally turns bronze in autumn. The acorns are ovoid, 7–13 mm broad and 17–31 mm long, a third to a half covered in a deep cup, green maturing pale brown about 18 months after pollination; the kernel is very bitter.